St.Kieran's Well - Seir Kieran's N.S. St. Kieran's well is situated in a field a few metres off the road which leads from Clareen to Roscrea. 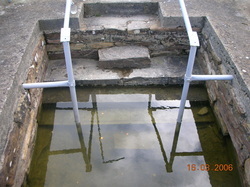 It is surrounded by an iron railing and a number of steps lead down to the well. The well has a reputation of never going dry. St. Kieran's well is the ultimate focus of devotion at St. Kieran. It is the first station in the procession on St. Kieran's Day and pilgrims return to the well daily, often after dark during the Octave. The pilgrims circle the well three times clockwise saying prayers at the same time.